If you find yourself facing a suspicious Dopeoffersonly.com webpage on your screen, then this might be a sign that you are a victim of adware (also known as ‘ad-supported’ software). What is adware? Adware is a type of invasive apps — which can hijack PC systems — occasionally reroute your web browser to certain web-pages so the owners of those sites can generate money by displaying advertisements to visitors. 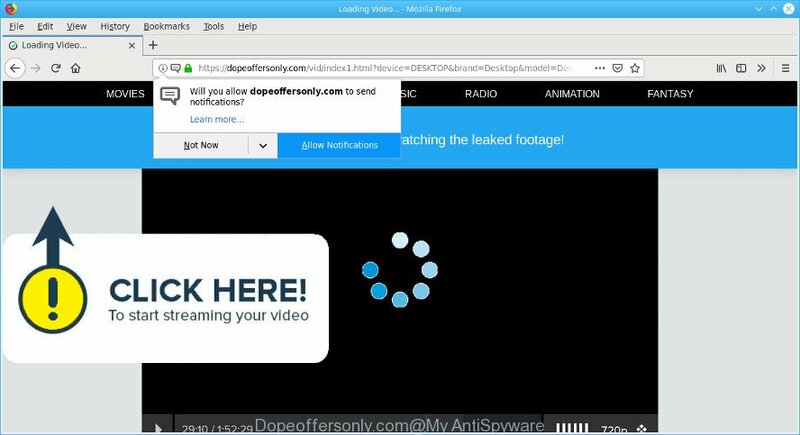 The ad-supported software related to Dopeoffersonly.com popup advertisements can attack your computer’s browsers such as the Internet Explorer, Chrome, Mozilla Firefox and Microsoft Edge. Maybe you approve the idea that the pop-up ads from it is just a small problem. But these intrusive Dopeoffersonly.com ads eat PC resources and slow down your PC’s performance. The worst is, the ad-supported software be able to collect a wide variety of marketing-type data about you such as what web-sites you are opening, what you are looking for the Internet and so on. This privacy information, subsequently, may be sold to third parties. The tutorial below explaining steps to remove Dopeoffersonly.com popups problem. Feel free to use it for removal of the adware that may attack Firefox, MS Edge, IE and Chrome and other popular web-browsers. The few simple steps will help you get rid of adware and thereby clean your web browser from all undesired advertisements. The following step-by-step guidance will allow you to get rid of Dopeoffersonly.com pop up advertisements from the Internet Explorer, Chrome, Mozilla Firefox and Edge. Moreover, the steps below will allow you to remove malware, browser hijackers, potentially unwanted software and toolbars that your system may be infected. Please do the guidance step by step. If you need help or have any questions, then ask for our assistance or type a comment below. Some of the steps below will require you to exit this web-page. So, please read the steps carefully, after that bookmark or print it for later reference. If you perform exactly the steps below you should be able to remove the Dopeoffersonly.com redirect from the Internet Explorer, Google Chrome, Microsoft Edge and Firefox web browsers. First method for manual ad-supported software removal is to go into the Windows “Control Panel”, then “Uninstall a program” console. Take a look at the list of software on your PC and see if there are any suspicious and unknown programs. If you see any, you need to remove them. Of course, before doing so, you can do an Net search to find details on the program. If it is a potentially unwanted program, adware or malware, you will likely find information that says so. Make sure you have closed all browsers and other programs. Next, delete any unknown and suspicious applications from your Control panel. Look around the entire list of software installed on your computer. Most probably, one of them is the ad-supported software that responsible for the appearance of Dopeoffersonly.com pop up ads. Choose the dubious program or the program that name is not familiar to you and uninstall it. 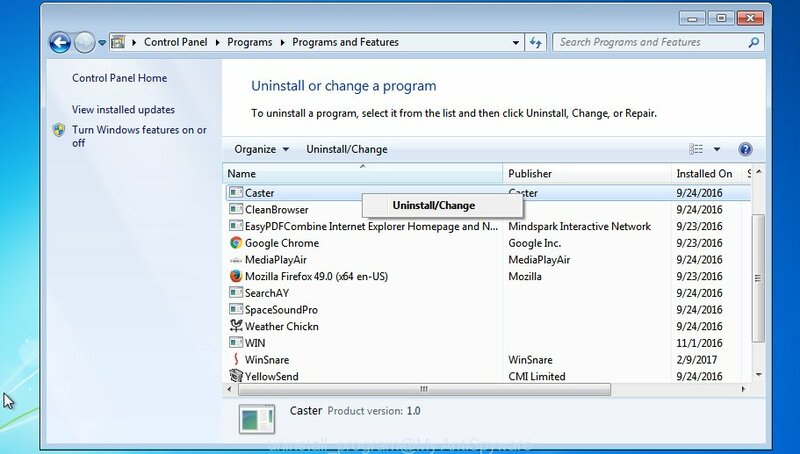 Choose the suspicious or any unknown apps, then click “Uninstall/Change” button to remove this undesired application from your personal computer. If your Chrome internet browser is re-directed to unwanted Dopeoffersonly.com web-page, it may be necessary to completely reset your web browser program to its default settings. You’ll see the list of installed addons. If the list has the add-on labeled with “Installed by enterprise policy” or “Installed by your administrator”, then complete the following guidance: Remove Chrome extensions installed by enterprise policy. 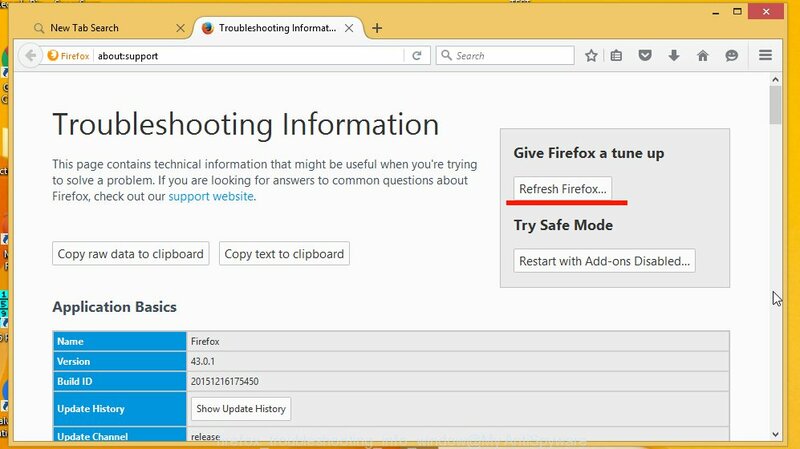 Resetting your Firefox is basic troubleshooting step for any issues with your web browser application, including the redirect to Dopeoffersonly.com web site. However, your saved bookmarks and passwords will not be lost. This will not affect your history, passwords, bookmarks, and other saved data. 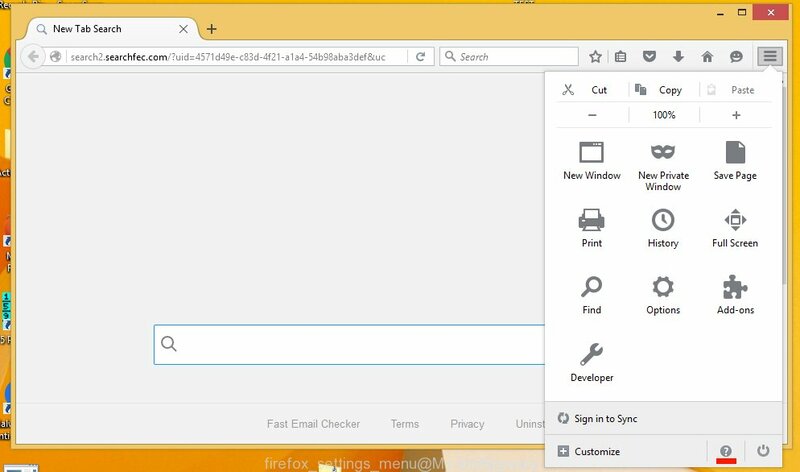 If you find that Internet Explorer internet browser settings such as homepage, new tab and search provider by default had been changed by adware that causes a lot of unwanted Dopeoffersonly.com pop-up ads, then you may restore your settings, via the reset internet browser procedure. You will now need to reboot your personal computer for the changes to take effect. It will get rid of adware that created to reroute your browser to various ad web pages like the Dopeoffersonly.com, disable malicious and ad-supported browser’s extensions and restore the Internet Explorer’s settings like startpage, newtab page and default search provider to default state. Using a malware removal utility to look for and remove adware hiding on your PC system is probably the easiest way to remove the Dopeoffersonly.com popup ads. We recommends the Zemana Anti Malware (ZAM) program for Windows computers. Hitman Pro and MalwareBytes AntiMalware (MBAM) are other anti-malware tools for Windows that offers a free malicious software removal. We advise using the Zemana. You may download and install Zemana Anti-Malware to locate and delete Dopeoffersonly.com pop ups from the Google Chrome, Internet Explorer, Firefox and Edge browsers. 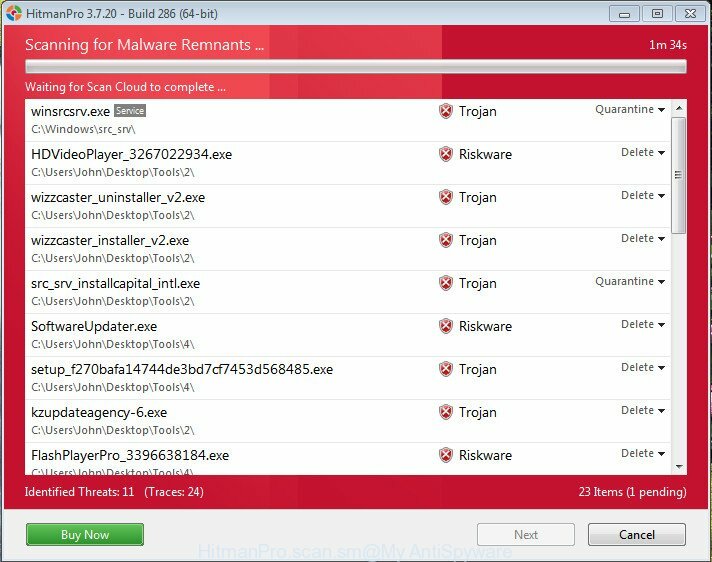 When installed and updated, the malware remover will automatically scan and detect all threats present on your machine. Once install is finished, click the “Scan” button to perform a system scan for the adware responsible for redirections to the Dopeoffersonly.com. Depending on your system, the scan may take anywhere from a few minutes to close to an hour. While the Zemana Anti-Malware is checking, you may see how many objects it has identified either as being malware. 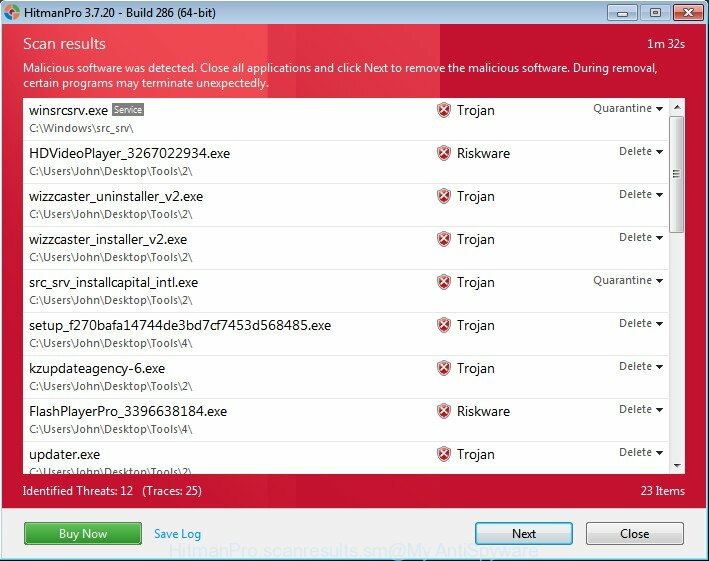 When the checking is finished, Zemana Anti Malware will produce a list of unwanted programs adware. Review the scan results and then click “Next”. After the process is done, you can be prompted to reboot your PC system. Hitman Pro is a free removal utility. It removes potentially unwanted apps, ad-supported software, browser hijackers and undesired browser extensions. It will identify and delete ad supported software that causes internet browsers to open annoying Dopeoffersonly.com pop-up advertisements. Hitman Pro uses very small computer resources and is a portable program. Moreover, HitmanPro does add another layer of malware protection. Installing the Hitman Pro is simple. 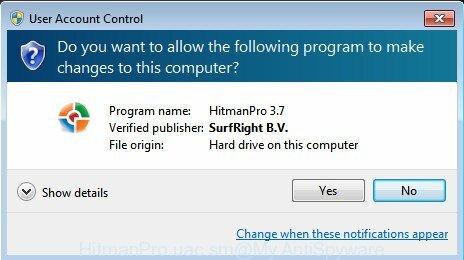 First you will need to download HitmanPro on your Windows Desktop from the link below. After the download is done, open the folder in which you saved it and double-click the HitmanPro icon. It will start the Hitman Pro utility. If the User Account Control dialog box will ask you want to run the program, click Yes button to continue. Next, click “Next” to start checking your computer for the ad-supported software related to Dopeoffersonly.com ads. Depending on your machine, the scan can take anywhere from a few minutes to close to an hour. After the scan is done, you can check all items found on your system as shown in the figure below. Review the report and then click “Next” button. It will open a prompt, click the “Activate free license” button. The Hitman Pro will remove ad supported software related to Dopeoffersonly.com popup advertisements and move threats to the program’s quarantine. After disinfection is done, the utility may ask you to restart your PC system. If you’re having problems with Dopeoffersonly.com ads removal, then check out MalwareBytes AntiMalware (MBAM). This is a tool that can help clean up your computer and improve your speeds for free. Find out more below. Download MalwareBytes on your Windows Desktop by clicking on the link below. Once installation is complete, click the “Scan Now” button to begin scanning your PC for the adware responsible for Dopeoffersonly.com ads. This procedure can take quite a while, so please be patient. 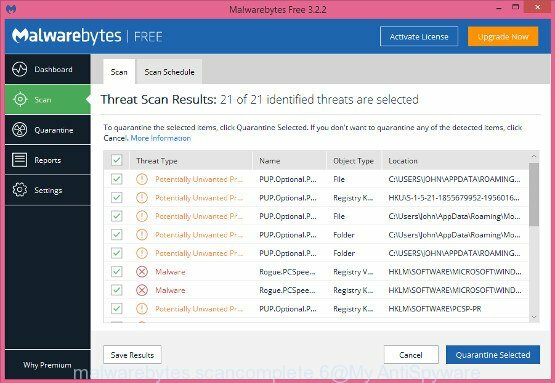 During the scan MalwareBytes Anti Malware will search for threats exist on your computer. Once MalwareBytes AntiMalware (MBAM) completes the scan, MalwareBytes AntiMalware will show a list of all items found by the scan. All detected threats will be marked. You can delete them all by simply click “Quarantine Selected”. When finished, you can be prompted to reboot your PC. The following video offers a guidance on how to get rid of hijacker infections, ad supported software and other malware with MalwareBytes Anti Malware (MBAM). Running an adblocker program like AdGuard is an effective way to alleviate the risks. Additionally, ad blocking applications will also protect you from malicious ads and web-sites, and, of course, block redirection chain to Dopeoffersonly.com and similar webpages. Once the install is done, click “Skip” to close the setup program and use the default settings, or click “Get Started” to see an quick tutorial that will help you get to know AdGuard better. In most cases, the default settings are enough and you do not need to change anything. Each time, when you start your computer, AdGuard will run automatically and stop unwanted advertisements, block Dopeoffersonly.com, as well as other malicious or misleading web-sites. For an overview of all the features of the program, or to change its settings you can simply double-click on the icon named AdGuard, which is located on your desktop. Most commonly, the adware is bundled within the setup files from a free hosting and file sharing websites. So, install a free software is a a good chance that you will find a bundled ad supported software. If you don’t know how to avoid it, then use a simple trick. During the installation, select the Custom or Advanced installation method. Next, click ‘Decline’ button and clear all checkboxes on offers that ask you to install third-party software. Moreover, please carefully read Term of use and User agreement before installing any software or otherwise you can end up with another unwanted program. Now your system should be clean of the adware that causes tons of annoying Dopeoffersonly.com pop-up ads. We suggest that you keep AdGuard (to help you stop unwanted pop up ads and unwanted harmful pages) and Zemana Anti-Malware (to periodically scan your computer for new malicious software, hijackers and ad supported software). Make sure that you have all the Critical Updates recommended for Windows OS. Without regular updates you WILL NOT be protected when new hijackers, malicious programs and adware are released. If you are still having problems while trying to remove Dopeoffersonly.com popup advertisements from your web browser, then ask for help here.